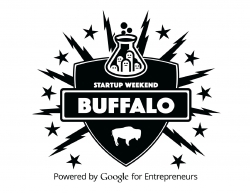 Techstars’ Buffalo Startup Weekend is back by popular demand for its 8th event. The weekend-long immersion into starting a business is open to anyone who is interested in pitching and/or developing a startup idea – from high school students to adults, from anyone with an idea to seasoned entrepreneurs, developers, designers, and marketers. This year’s event, presented by Viaduct, will take place over the weekend of September 14 to 16, 2018. Buffalo, NY, August 16, 2018 — Weekend-long startup competition for students and professionals returns for its eighth year to foster entrepreneurship, innovation, and collaboration in Buffalo, NY. Techstars’ Buffalo Startup Weekend is back by popular demand for its 8th event. The weekend-long immersion into starting a business is open to anyone who is interested in pitching and/or developing a startup idea – from high school students to adults, from anyone with an idea to seasoned entrepreneurs, developers, designers, and marketers. This year’s event, presented by Viaduct, will take place over the weekend of Friday, September 14 through Sunday, September 16, 2018 at Hayes Hall on the University at Buffalo South Campus, 3435 Main Street, Buffalo, NY 14214. Friday evening is dedicated to startup ideation and pitches. Teams will form around the top ideas, determined by popular vote. And then a two-day frenzy ensues, full of business-model creation, coding, designing, and market validation. No experience is necessary. Local business leaders will mentor teams to help participants codify their business models over the course of the weekend. The weekend culminates with presentations on Sunday afternoon in front of local entrepreneurial leaders who will serve as judges, including Jenae Pitts, managing partner of OneTen Capital. Top teams will receive recognition and prizes that support the development of their startup into a fully fledged business. The winning team will also be featured on stage at the 2018 43North finals on October 3, 2018, at Shea’s Performing Arts Center, as well as on Latitude, the 43North podcast. Whether entrepreneurs start new companies, meet a cofounder, connect with someone new, or learn a skill that falls outside of their usual 9-to-5 demands, everyone is guaranteed to leave the event better prepared to navigate the chaotic but fun world of startups. For individuals ready to put themselves in the shoes of an entrepreneur, there’s no startup competition that’s as friendly, fun, and full of energy. Over the last seven years, Buffalo Startup Weekend has garnered widespread media attention, with coverage from The Buffalo News, Business First, WBFO 88.7 FM, WGRZ Channel 2 News, and WIVB-TV News 4 Buffalo. Organized by a team of technologists, entrepreneurs, and startup leaders, Buffalo Startup Weekend 2018 is supported by companies that foster innovation and entrepreneurship in the region. In addition to Viaduct, sponsors of this year’s event include OneTen Capital, WNY Incubator Network (WIN), InfoTech WNY, ACV Auctions, Colligan Law, LaunchNY, and Elmhurst. Although Buffalo Startup Weekend is a local event, Startup Weekend itself is global and our event is a program run by Techstars, the worldwide network that helps entrepreneurs succeed. Since its inception, over 2,900 Startup Weekend events have been organized in over 150 countries with over 23,000 teams forming to develop their business ideas. Tickets are available now, and early-bird discounts are offered at 50% off until September 1. Six meals from local restaurants are included in the ticket price, as well as a commemorative t-shirt. Coffee will be provided by Tipico Coffee and plant-based milks by Elmhurst. Participants are encouraged to sign up early, as the event is capped at 150 participants and is expected to sell out.